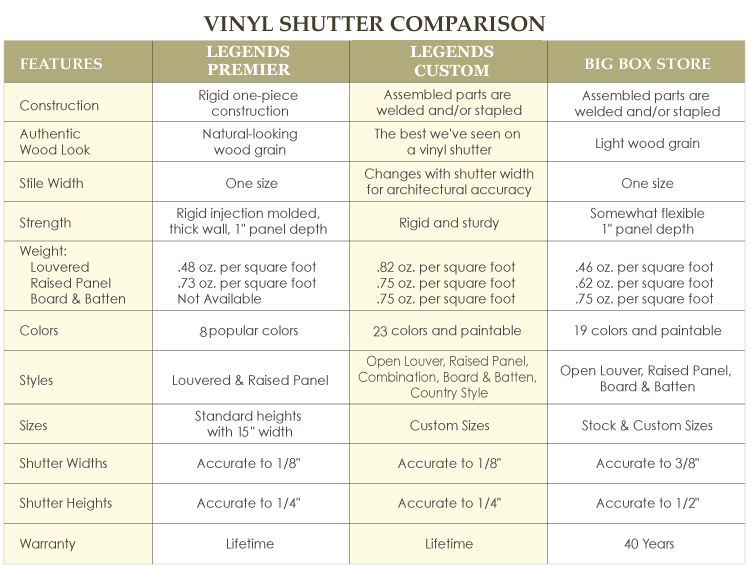 We're proud to offer our Legends vinyl exterior shutters to homeowners and builders. Years of development have resulted in a sturdy vinyl shutter with realistic wood grain that withstands the elements without fading, Affordable, durable and beautiful, Legends vinyl shutters will add instant curb appeal to your home. And we offer free shipping on all Legends Vinyl Shutters! Vinyl Louvered, Raised Panel, Country Style and Combination Shutters ship in 7 to 10 business days, Please note ship times may be extended due to seasonal demand. PLEASE NOTE: Legends Builders Grade Vinyl Shutters can be returned within 30 days of receipt for a refund, subject to a 30% restocking fee and return shipping costs. All other Vinyl Shutters are custom-made to order, and are non-refundable. How are Legends Vinyl Shutters made? The Legends Premier Grade vinyl shutter is a one-piece, injection molded vinyl product and Legends Premier vinyl shutters are assembled using precision, heavy-duty parts that are electrostatically welded and stapled. Are Legends Vinyl Shutters operable? No, they are not. Our Legends composite, wood and aluminum shutters provide that option. On what types of surfaces can I install the exterior vinyl shutters? The decorative vinyl shutters can be installed on any surface used for construction of a building. The fasteners are provided for the shutters and a 1/4” drill will be the correct size for Legends Vinyl Shutters. The type of drill bit should be correct for the material the house is made of. A brick, concrete block, stucco on concrete will require a masonry-type drill bit and wood or vinyl will use a high speed bit. Can I paint vinyl shutters? Legends Premier Grade Vinyl Shutters are not paintable. Legends Premier shutters do come in a paintable finish (select "paintable" from the color drop down option). We suggest you follow your paint company’s instructions for priming and painting. You can use any quality oil or water based exterior paint to finish the shutters. Please see "How to Paint Vinyl Shutters" below for general instructions. How thick is the material used on your exterior vinyl shutters? 3/16” to 1/4” thick, based on the structural requirements of a particular area of the shutter panel. Legends Vinyl Shutters are roughly 12% heavier and considerably more rigid than the competition. How thick are the vinyl shutter panels? Are your vinyl shutters open back or two-sided? The process of manufacturing vinyl shutters leaves the back of the shutters open or hollow. Vinyl shutters must be fixed-mounted. Are the height and width of the vinyl shutter panels exact sizes? Legends Vinyl Shutters are the exact width ordered with minor differences in the ordered length. These minor differences in length, for most situations, have little or no visual effect when viewed from a normal distance and are simply normal production variances. Legends Vinyl shutters have a deep, true wood grain finish. How To Clean Vinyl Shutters? With a garden hose and a soft bristle brush wash your shutters gently. In certain geographical areas where mildew may be a problem, substitute one quart of 5% sodium hydrochloride (Clorox for example) for one quart of water in the formula above. Where your vinyl shutters shutter is extremely dirty, it is recommended that you start washing from the top and work down to the bottom. Apply cleaning solution and let stand several minutes in order for the dirt to loosen. The shutters and siding must be rinsed thoroughly to avoid staining and/or streaking. Do not expose shutters to direct sunlight before, during or immediately after painting. Temperature should be between 60 and 90 degrees Fahrenheit for best results. Clean shutter panels using a mixture of ammonia and water, 1 cup per gallon, or soap and water, follow directions on container. Rinse thoroughly and allow to dry one hour. Prime Shutter with a good primer. Follow manufacturer's recommendations. For Best results use high quality oil base or latex paint for top coat. DO NOT USE ANY TYPE OF VINYL BASED PAINT. Apply two coats of finish paint following the manufacturer's recommendations on the amount of time between coats. The paint can be applied with a brush or spraying following the paint manufacturer's recommendations. Allow the shutter to dry four days prior to installation, especially if the shutter will be exposed to direct sunlight and high temperatures. This will allow the paint to fully cure.